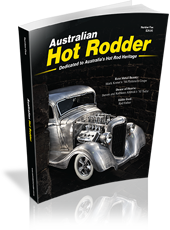 Hot rodding has a long and proud history in this country dating back several decades and Australian Hot Rodder is dedicated to paying homage to the hot rodders who have helped create the wonderful hobby we all enjoy today. 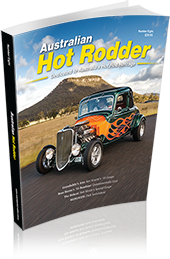 With every issue of Australian Hot Rodder the rich history of the hobby will come to life through the words and photographs of our small, but passionate team of writers and photographers who bring years of experience to the periodical. We will seek out the pioneers of hot rodding in this country and their cars and give them their due respect by telling their story in a way that has never been told before. But we are not just about the past, we will also pay due and proper respect to the later generations of hot rodders, including those currently building cars, who are building on the early foundations laid by our pioneers by creating great cars themselves and continuing the tradition. As well as the grand old cars that kick-started the tradition back in the post-WW2 years we will also be searching out newer cars that have been built along traditional lines. We’re not just after the show winners. The cars you will see in Australian Hot Rodder won’t necessarily be the shiniest cars that have won the biggest trophies; they will often be road-scarred cars that have been driven and driven, and driven by their builders. 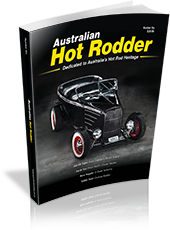 According to tradition hot rods are built to be driven and we at Australian Hot Rodder will also honour those hot rodders who have forsaken the show circuit for the long road. 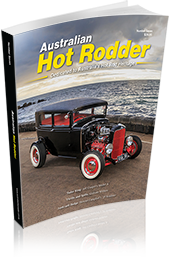 Producing a high quality periodical like Australian Hot Rodder is a lot like building a great hot rod, it takes, experience, patience, and above all passion.